You'll find the words, "So it's been a long time since we've blogged" or "sorry I haven't been able to get around to an update but things have been crazy." So joins the Fergusons amongst these missionary excuse-makers! Haha! Well, we've had quite a month so far. Oh and please forgive me because I am behind on my support thank you cards and (of course) my blogging. It seems like this months has been the month of visitors. What an AMAZING blessing! We can't tell you how much we look forward to this part of our time here. We LOVE talking to new people about what God's doing in their lives, what brought them to Kenya and what God is or has taught them. Jonathan just left the house to see a movie with some visitors we've had, Ray and Nate. Ray and Nate attend and serve Calvary Chapel Costa Mesa. It's been so neat to have these new friends and people from our area come to stay with us and with Robbie and Elizabeth. We've been so blessed by their gifts! Ray and Nate work in the office for the Children's Ministry at Costa Mesa and have a great heart to do whatever needs to get done! They've done everything from build chicken coupes, to helping us chop wood, working in an orphanage, moving large boulders, helping the church move. They've been such a blessing to our family and Living Water Christian Felloship. Nate also plays the guitar and leads worship so we've been taking advantage of their gifts as much as possible! What an amazing time it has been to watch these to 21-yr. olds just come out to serve in whatever capacity they can. What an encouragement it has been! We'll post a picture of all of us together soon. If you are interested in reading about their adventures, I'd HIGHLY encourage you to. The blog is: seraphim188.blogspot.com. 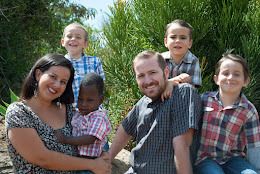 The Herscowitz Family is a beautiful family that's been serving Jesus in Kisumu, Kenya for 5 years and the Lord called them back to their hometown in California. We can't begin to tell you all we learned from them and what a blessing it was that this family ended their time in Kenya in our home. The Herscowitz's departure was delayed for several months due to some hold-ups with their son, Paul's adoption and visa issuance. What a test of faith it was! Down to the day they before they were supposed to leave they STILL hadn't received the proper documents. We prayed in faith knowing God had a plan and the Lord saw to it that the visa was issued the day before they needed to leave. Praise God! We were overjoyed that they were finally able to take their son home but so sad that their time with us was over. We'd spent many late nights talking and we were so encouraged by their witness. We've had a few other visitors come and stay including a couple that just moved out to Kenya two weeks ago from Georgia and another young guy from Texas who will be here in Kenya will mid-June. We are SO excited for this week! Our very own Helen Parks will be coming to stay with us for TWO WEEKS! We are so excited! I may just burst into tears when I see her! Praise God for all the new and old friends. We can't tell you how nice it is to have people around and how we get the incredible privilege to watch and learn about their experiences on the mission field and as a follower of Jesus. I am so excited I got the opportunity to join a Tuesday Bible Study lead by a long-time missionary, Vicky Vule. We are going through the Beth Moore study, "A Woman's Heart". I have found myself SO excited about the homework and SO looking forward to Tuesdays to just be fed and poured into. What an amazing gift it has been to join these women! U-Turn for Christ is a ministry here in Kenya that helps Kenyans get off of drugs and alcohol. At the facility, they are introduced to Jesus and have Bible studies amongst other things. Every year they put a pig roast together and Jonathan had the honor of attending this fun-filled celebration. The families of those in U-Turn are welcome to come to the event and it's just a neat day of celebrating what God has done. I stayed home and Jonathan, Josiah, Christopher, Ray and Nate attended the pig roast. Jonathan was especially encouraged by the testimonies that were personally shared by those in U-Turn. The even was scheduled to start at 9AM and Jonathan thought, "Hmmm...I'll show up at ten so we aren't the first ones there." Jonathan called me and says, "It's 10:15 and we are the FIRST ones here!!!!" Well, that's Kenyan time for ya'! Well, since it's been so long, that's enough catching up for now. Thanks so much for stopping by and catching up to what the Ferg5 are up to! The Fergusons as they drive around and Kenyans taking public transport-those who drive public transport are endangering people's lives on the road and in their matatus (mini buses). There isn't a month that goes by that we aren't nearly in an accident. It's by God's grace that He's kept us so far!